Bird flight is notoriously hard to animate convincingly, and there are many reasons for this. The action is very fast, but even in slow motion it is often hard to understand what's happening underneath because the bones are concealed by feathers, plus the movement is completely alien to us, it's not something we can act out or get a feel for. When investigated thoroughly, many things about flight seem odd, even counterintuitive. Over the years I've animated quite a few birds and have slowly gained a rudimentary knowledge of the dynamics and biomechanics of flight, as well as how to apply some of the traditional animation tricks to it. So, here are my tips to make your bird "fly good" and avoid the traps that many fall into. I hope it helps. I've tried to keep the tips quite concise, but I've added further detail and explanations under the text links that look like this. 1. Birds don't swim through the air. Swimming is the closest thing we experience to flying, and it is tempting to animate bird flight like an airborne swim-cycle. Because of the vast difference in density between air and water, this can often lead us astray in a number of ways. Here is an animated toucan from George and the Jungle (ignore the flying elephant in the background)*. And here are a couple of up and down wing poses from that movie. 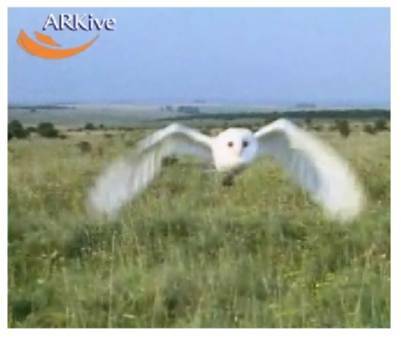 As you can see the animator has positioned the wings in the first image up and forward, then they move backward and down, pushing the air down behind, propelling the bird forward. It makes sense, right? In fact, the exact opposite is true. As the bird's wings move downwards, they are pushed forward and then rotate back as they return to the up position. The reason for this is simple once you understand lift, and if you'd like an explanation click below. As a general rule the slower the bird is flying, the further forward it'll push it's wings to generate extra lift, the faster a bird is flying the less it'll push it wings forward. 2. The all important humerus. There are a number of issues with this animation, but for the moment lets look at what I think is most jarring about the motion - the up and down ratio of the wings. The wings have been animated to rotate down faster than they move up, at one point I count them moving down twice as fast as they move up (3 frames down, 6 up). This is another mistake that is commonly made and is something real wings just don't do. Again, this sort of makes sense - the bird pushes the air down as hard and fast as he moves up, like he's swimming ... But, of course, birds don't swim through the air. The bird does push it's wings down as fast as it can, but the wings have a greater surface area and therefore resistance to the air on the way down, where as on the way up the bones in the wing rotate in various ways to reduce the surface area and increase the speed at which they can move them. We'll go on to look at these other rotations later but for now I just want to focus on one rotation. In animation terms this is just the rotation of one bone, the one that is closest to the bird's body; the humerus. And for now we'll look at it's rotation in just one axis, the up and down. I'm going to go into quite a lot of detail on this because I believe that this is one of the most important parts of a flight cycle, all other bones in the wing are effected or initiated by the humerus rotation. I find this is one of the best places to start when animating a bird in flight so it's paramount to get it right. First we'll look at the time taken for the humerus to rotate up, compared to the time taken to rotate down in flight. Remember that the owl in the Harry Potter movie had more frames of rotating up than down, at it's most extreme point -3 frames down, 6 frames up . As you can see, the opposite of the Harry Potter owl is true. The wings take longer to rotate down than they do up, in this owl's case, almost double the amount of time taken than to rotate up. But the eagle owl is a large bird, and the speed and ratios are effected by the size of bird. 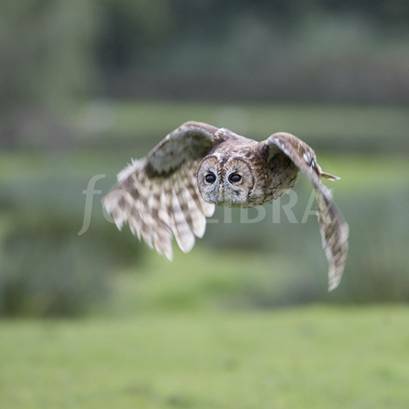 If you would like to see this experiment repeated with tawny (small) and barn (medium) owls click below. Now let's look at the spacing on this joint as it rotates up and down. 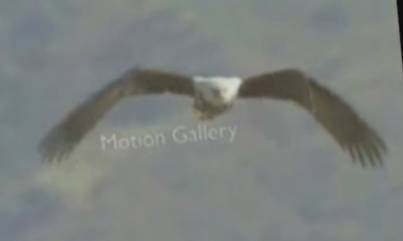 In this movie* I've taken some footage of a bald eagle flying, and tried to create a loop so we have a live-action cycle to study. I've roughly tracked the eagle's body to reduce it's vertical movement so we can focus on the rotations of the wings. Initially you'll see the cycle with out any visual aids, later I've added an orange line that follows the humerus, then I 've put a copy of the line's position every two frames in green so we can see the spacing. Here are some images from that movie that show the maximum rotations of the humerus as well as the spacing of the inbetweens. We can see from the amount of lines that there are more frames rotating down than up, further confirmation of the wing ratio we discovered above. As you might expect the spacing is widest at the middle point of both the up and down of the wing, and the spacing decreases as the bone arrives and departs from both the top and bottom of the stroke. However, at the top of the down-stroke there is a denser clump of green lines (marked with an A). This signifies a slower section, almost a pause in the rotation of the humerus. Watch the movie again, at this point in the cycle the lower part of the wing seems to 'wait' for the the rest of the wing to straighten out before the wing continues on it's down-stroke. This image shows, in my experience, a rough approximation of how the vertical rotation curve of the first joint in a flight cycle should look. 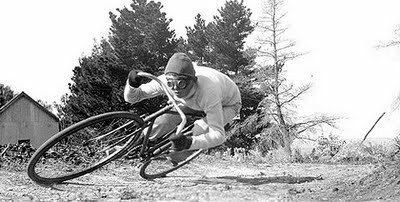 It incorporates all the points we've established above - the slower down-stroke, faster up and a slight pause at the top. It is very easy to make wings look floppy, like in the Harry Potter film above, and often the reason is that the bones have been rotated in an inaccurate way. The easiest way to get a feel for how the wing bones rotate is by comparing them to the bones of a human arm. As we have discovered, the wing and the human arm consist of the humerus which at one end is attached to the main thorax via the scapula. They also both have two bones that extend from the humerus, the ulna and the radius. 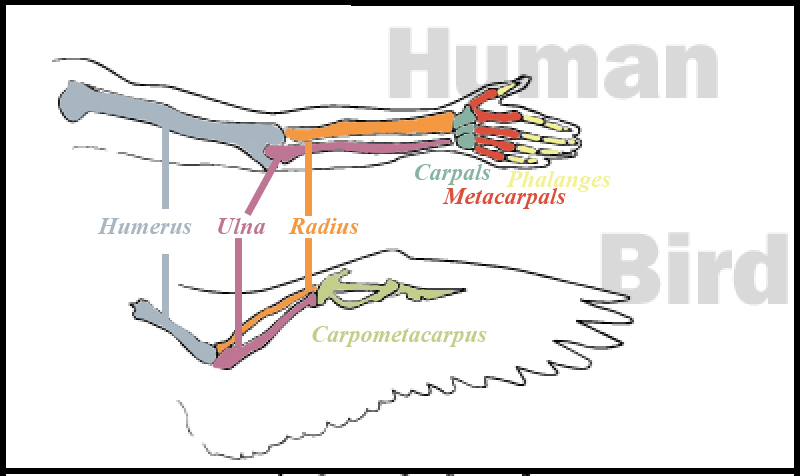 Further down the arm we discover a big difference, the human hand has many small and separate bones, where in the wing, the hand bones have fused together to form the carpometacarpus which is composed of modified hand bones (carpals and metacarpals). Like the humerus in a human arm, the humerus in the wing is also capable of rotating in all axes - the up/down rotation is obviously the biggest of the rotations, the back and forth occurs in flight, as we discovered above, forward on the way down, then back on the way up. The humerus also rotates along the arm, this is called medial rotation, it twists the leading edge of the wing down lower than the back on the down-stroke and turns it up on the up stroke. When we get to the ulna and radius, we start to find some differences in movement to a human arm. We can rotate these bones in two axes - the first allows the arm to bend and straighten at the elbow. The other rotation happens along the arm, this is called called pronation and is harder to see, it is often confused with the medial rotation in the shoulder. Birds are not capable of actively rotating their radius about their ulna and therefore cannot pronate their hands. If this is unclear, you can isolate medial rotation in the shoulder from pronation of the forearm in yourself by standing with one's elbows tucked against the trunk of your body, with the elbows flexed to 90 degrees with the forearms pointing directly in front of the body, the act of moving one's forearms so that the palms are facing downwards is pronation of the forearm. The rotation of the elbow is shown above. The humerus rotates in an opposite direction to the ulna and radius on the same axis to make the wrist move toward and away from the bird's body. This acton is one of the mechanisms that helps the wing gain and lose surface area in the flap cycle. The arm stretches out on the way down, increasing surface area and then the wrist is pulled in during the up stroke to help it pass through the air easily. The carpometacarpus rotates in the same way as a human wrist, although birds have a greater range of movement. Back and forth and up and down. The vertical rotation is responsible for the most visible bend in the wing as it rotates up, which also acts as another mechanism which reduces air resistance in the up-stroke. The back and forth rotation on this joint also aids this, rotating forward on the way down, spreading the end of the wing, then rotating back on the way up reducing the surface area. The modified digits that form the carpometacarpus are not totally rigid, there is a small degree of vertical rotation through these joints. These are of course just rough guides as to how the bones in the wing rotate during flight, the wings cannot be simplified into two up and down key frames. Each rotation is subtly offset from the others, and these offsets are best discovered by close observation. Unfortunately, where the bones are located in the wings is not immediately obvious because the feathers hide them. 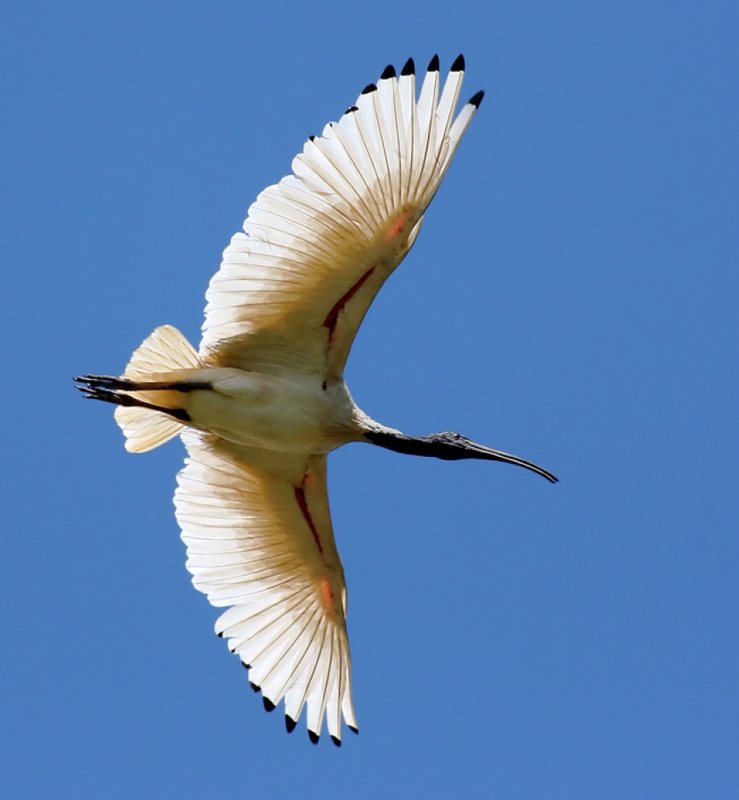 However, there is a bird in which we can see the bones clearly, one that is common here in Australia; the White Ibis. It has no feathers along the bones on the underside of it's wing, and when it displays it's breeding plumage these patches of skin turn a vivid blood-red colour. Here is an image of a White Ibis in flight showing full breeding plumage, in this instance the bird is pushing it's wings down and the arm is stretched out. As you can see, we get a good view of where the bones are positioned in the wing, notice that they don't run along the front of the wing. The elbow is set back from the leading edge and the bend in the arm is hidden by the Propatagium, a fold of skin inside the front part of the wing which connects to the shoulder and the wrist. Here again is an Ibis in flight, the wings are raised up and the arm is more bent, with the elbow even further back than it appeared in the image further above. I have highlighted the propatagium in pink. 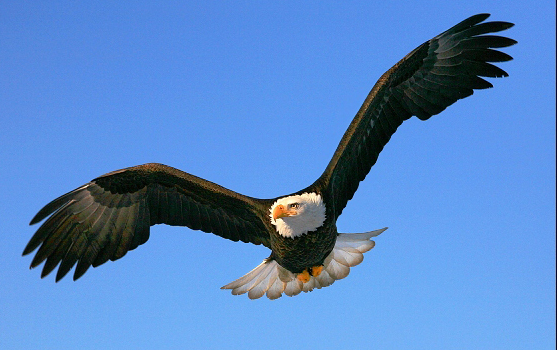 The bald eagle, like most birds (including owls) have the bones in the upper arm concealed. In the image on the left, it's almost impossible to see where the bones are, the first section of the wing, closest to the body, looks like one solid object. Many animators mistakenly think that the first bend in the wing, when seen from the front, is the elbow. When, in fact, this joint is almost always hidden, and the first change in angle in the wing occurs at the wrist. 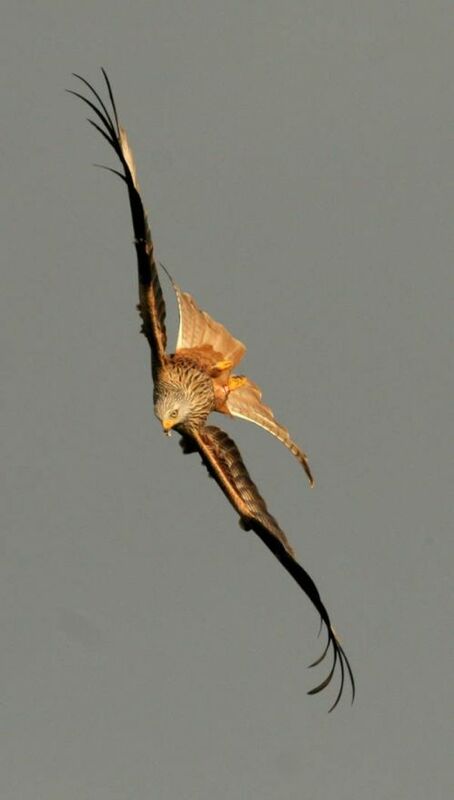 Notice the primaries at the end of the wing rotate 90 degrees to allow the air to travel past them in the up-stroke, yet another way birds reduce surface area, and therefore resistance as the wings rotate up. Although some birds' wings don't have this function, like barn owls. How much should we rotate the joints of our wing? Well, as we'll see there are a few factors that govern this but if we assume the bird is in a normal flight (ie. not taking off, landing or carrying something) then that's largely decided by the size of the bird - the smaller a bird is, the more bend there is on the wing during the upstroke. Let's look at some examples, all the pictures below are taken from a simular point in the bird's flight - the middle of the upstroke, were we'd expect the wings to be at their most flexed. Let's look at a very large bird, the bald eagle from earlier, note the amount of flex in it's wings in this image. 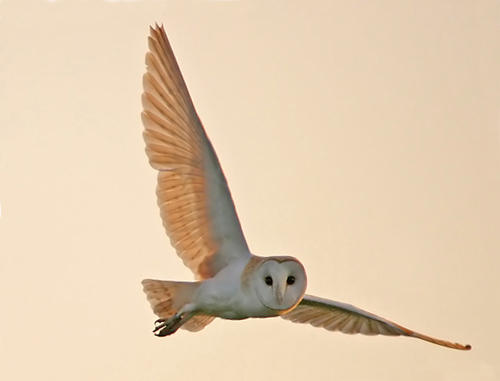 Barn owls are a medium sized bird and bend their wings more than the eagle, above, in the up-stroke. The Tawny owl is one of the smallest owls and again you can see the amount of flex in the wing during the upstroke is even more accentuated. This trend continues as birds get smaller, if we look at a very small bird, like this finch, we can see the up-stroke pose shows a very extreme fold on it's wings. Now that we have thoroughly investigated the bones of the wing, lets now look at the body and how it moves in flight. 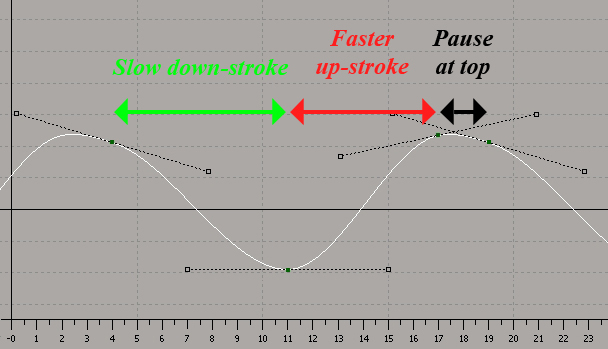 In the movie* above I have marked the body's highest and lowest points with green lines, then later an orange line follows the body as it translates between the two. Here are the body's highest and lowest points in the cycle. 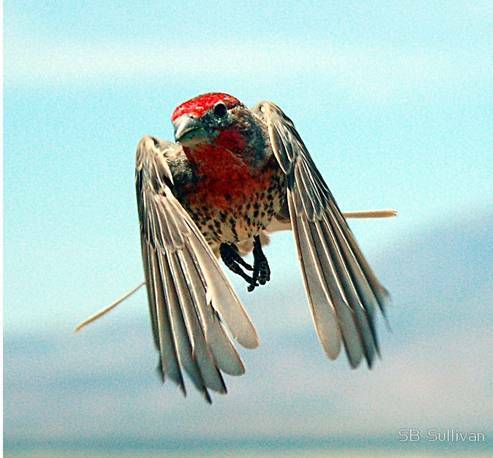 As you would expect, because of the bird's momentum, there is an offset in the up and down of the body to the wings. At the body's highest point, the wings have already started to rotate up, at the bird's lowest point the wings are already in the process of rotating down. Here I've created a very crude flight cycle, I've used 3 balls to represent the three body masses - the head, chest, and hips. At the moment they are all moving up and down at the same time, offset to the wings like we discovered above. But this is unrealistic and un-interesting so lets start by breaking the hips away from the motion of the body. Hips are easily overlooked in a flight cycle, but as we'll see they can be very important for selling your flight cycle. Many people fall into the mistake of animating them dragging behind the chest, like above, offset from the chest's vertical motion. This is not what actually happens in real life, and gives the impression that the hips are a dead weight that the rest of the body is fighting against. The motion is much more exaggerated here than it in normal bird flight, but this does show clearly what happens. Far from dragging behind the chest, the hips counter the wings movement - dropping down when the wings are up and then raising up as the wings come down and forward. Here I have applied this motion of the hips into my crude cycle. Here I've added a rough approximation of what the head does, see the eagle cycle at the top of this section. The head counters the chest movement, translating down as the chest moves up and visa vera. 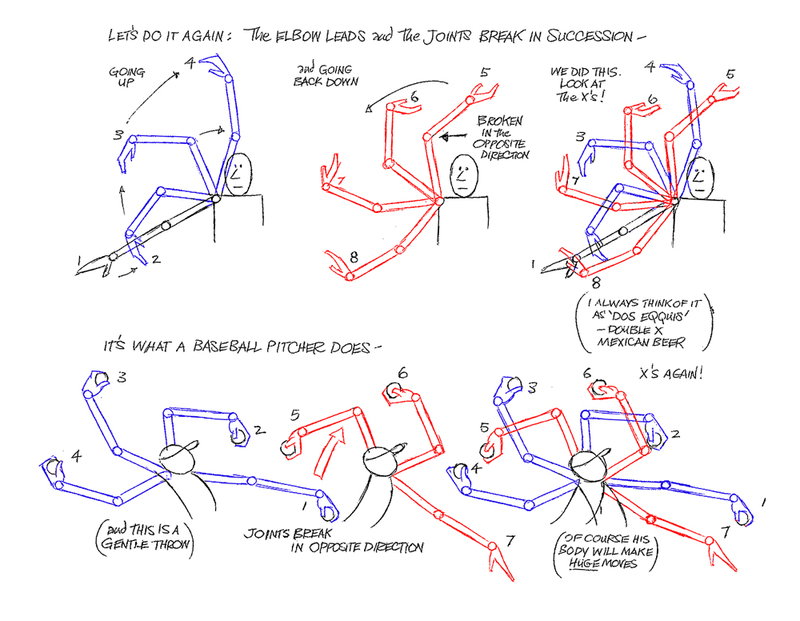 This is an animation trick Richard Williams explains in great detail in his book, The Animators Survival Kit, as a technique for making stiff, straight limbs to look fluid. Here is a page from the book where he explains how to make the arm's action smooth and fluid. The bottom example is interesting as the baseball pitcher's throw is a fast action. This is a technique we really want take advantage of in our flight animation, after all, we need to make a fast action look fluid and we only have straight bones to work with. 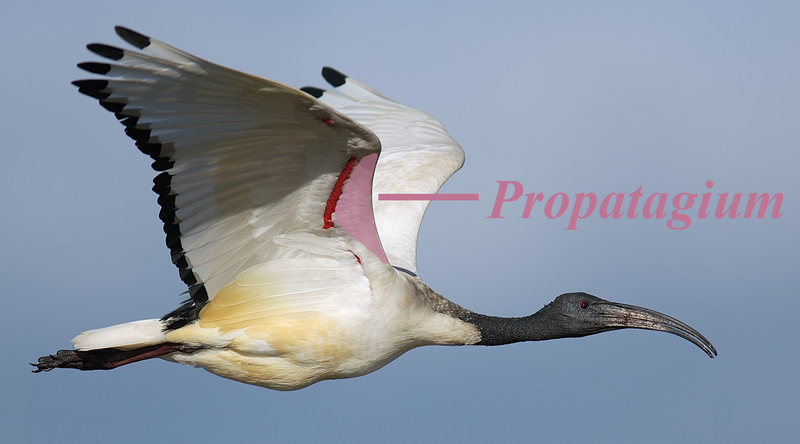 Here I have created an image to show one example when we can can apply it - when the birds wings are seen from the front. In 3d animation terms, this is achieved by an offset in joint rotations (in the z axis)- at the top of the stroke the arm starts to rotate down while the wrist is still rotating up and at the bottom of the stroke arm changes direction, rotating up while the wrist rotates down. It's a little different than the Richard Williams examples above, because the hinge in the wing is at the wrist, which gives the effect of the upper arm shrinking, when actually it's the bones hidden by the bird's Propatagium, rotating in opposite directions. Another example of using breaking joints in your cycle would be back and forth rotations (the y axis) if you were viewing the animation from above. Now we've discussed the bigger aspects of the flight cycle, joint rotations, body movement, etc. Lets now look at some small details which can help add a bit of finesse to our animation. When we view the flight cycle from the front, as the wings rotate up, the twist along the wing and the drag on the feathers at the back cause the underside of the wing to appear. It's usually in shadow and therefore creates a dark shape under the wing. I've highlighted the area I mean with blue above. 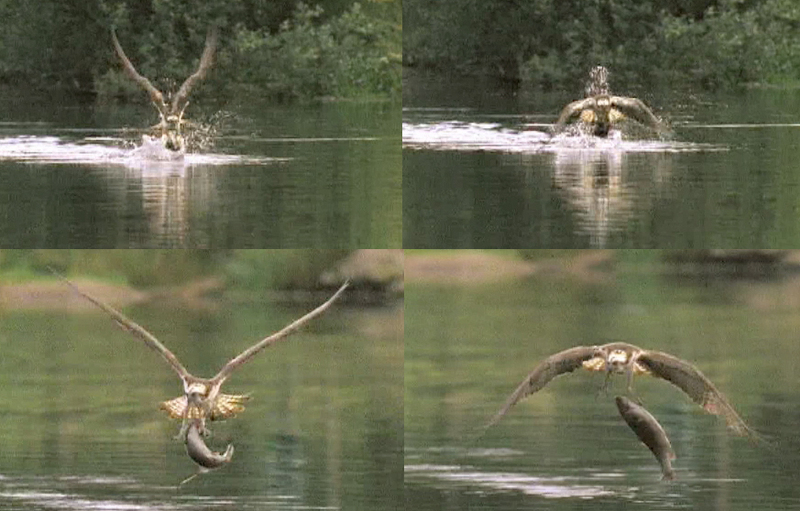 Above is a movie* of an osprey flying with a very big fish. Watch how the feathers on the underside of the wing appear and disappear as the wing rotates up. This shape under the wing doesn't just appear and disappear equally along it's length, but rather it develops, then recedes, changing shape and moving along the wing. In the sequence above I've highlighted the shape in blue, as the wing reaches the top of it's stroke, this fringe recedes, first at the point closest to the body, then moves along the underside of the wing with the primaries, the last feathers to rotate out of view. Note that in image 02, the shape has narrowed near the body, where further down the wing the breadth of the shape has actually increased. In some birds there is almost an equal amount of the feathers that appear above the wing on the down-stroke, and therefore an opportunity to animate this shape appearing and receding in a similar way. A bird's head is gyroscopic - it counters the roll of the body and will always try to keep itself straight to avoid getting disorientated in flight. 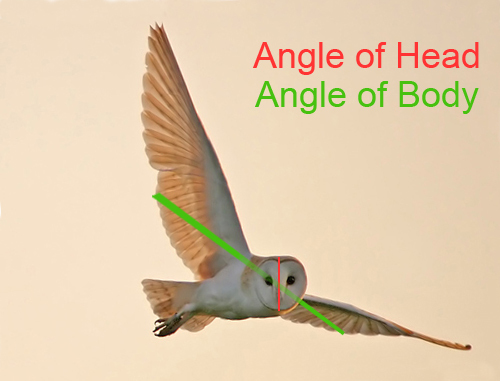 Below we can see how the Barn owl's head is straight even though his body is banked. This act of countering the body's rotation is not unique to birds, in fact many animals do this, including humans. However, birds are expert at this and their heads will lock more solidly to and through more extreme angles than other animals. - Always have the wings rotate down into a glide, not up. - Animate in Arcs, wrists, wing tips, even feet, when viewed from the front, side and above should all make a smooth, curved path through space. - Try to create a clean cycle - it is possible through thorough observation, and a lot of trial and error, to create a cycle that has no spikes in the function curves and looks good from all angles. If you can achieve this, it can become an invaluable asset. It will be easy to be speed it up or slow it down without unwanted actions occurring. It could also be quickly changed to suit a specific shot or other characters. Looking at the osprey's up/down humerus ratio as it struggles to get air bourne, I count a fairly constant 12 frames up to 20 frames down, (a ratio of 1/1.67). For a bird this size* this is about the wing ratio we'd expect for unladen flight. So it seems that the amount of effort a bird puts into it's flight does not effect this ratio. So how can we show effort? * Ospreys are medium/large bird, reaching 60cm length. One would think it would make sense for a bird under strain to move it's wings faster to stay in the air. This is true but not in the way we might expect. In the image above I have taken the highest and lowest points achieved by the wing tips (note: not the humerus). I've also counted the frames between each of these images so we can assess how the timing of the wing beats changes throughout the footage. Firstly, let's consider the timing of the wing beats. 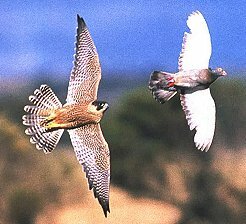 As I mentioned above, we would expect the wings to be moving faster at the start of the sequence, and for the flaps to get gradually slower as the bird's effort decreases. The first time the wing tips are at their highest point is frame 01, the next time the wings reach their apex is frame 12, this means the time taken to complete the first flap is 11 frames. The next frame at which the wings are at their highest, is frame 23, again 11 frames from the previous upper-most position. The last time in this sequence the wings are at their peak is frame 36, a difference of 13 frames. 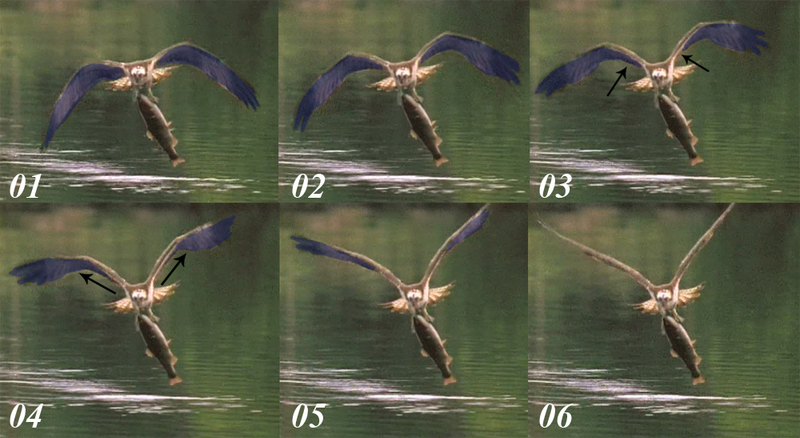 The most significant change to the wings in this sequence is in the range of the wings. In frame 01 the base of the wings are touching each other, in frame 12 the wings are again very high but there is clearly more space between them. In frame 23 the wings have once more not been raised as high as the last up-stroke, in frame 36 the height of the wings has decreased again and are now approximately 90 degrees apart. There is also a decrease in the amplitude at the bottom of the cycle throughout the sequence, however it is not as distinct as at the top. We can also see this wing range change in the osprey videos further up the page, above are some images showing the vertical extremes. When the bird is struggling to take off with the fish in the water, the wings are raised much higher than later in the sequence. When the fish has been pulled from the lake and the bird has more momentum. Also note the amount of flex in the wings increases with the increase in range of the wings. Another important way to show effort during flight is not through activity in the wings, it's in the hips. The amount of vertical hip movement increases with the effort the bird is exerting. As you can see in the video above*, the eagle has a lot of vertical hip movement when it first takes off, but as it's speed increases, and the flight requires less effort, the hip translation decreases. For further confirmation, we can also look at the pelican footage earlier, the extreme hip movement in that movie is due to the pelican flying at low speed, therefore having to exert more effort in it's wing beats. I'm afraid that's all I know, but I hope that it may have helped you in some way. Thanks for taking the time to read it!